AIR CHUNKY is a blended cashmere, silk and brushtail possum down yarn spun using innovative new technology. The yarn is ultra lightweight and lofty. 16 beautiful patterns designed by Claudia Pacheco, Tina Sopiak and Birgitte Sopiak. All the patterns showcase the luxurious Zealana Heron yarn, which is part of the Artisan Series. The delightful photos are taken at the Karori Wildlife Sanctuary in New Zealand. 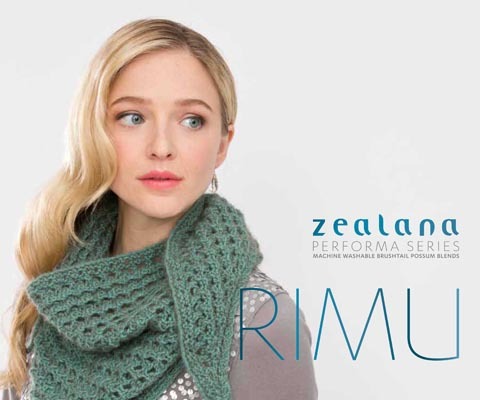 Luxury collection of hand–knits made in high performance RIMU yarn. RIMU is a machine washable merino & brushtail possum blend. From a generous fitting boyfriend cardi, through to an all over pattern carry all. The seasonless book features eleven beautiful patterns that can be worn anywhere at any time. All these luxurious patterns use Zealana yarns. Zealana combine natural fibres like cashmere, merino and brushtail possum to create ultra soft, durable, pill-resistant yarns that are light, warm and cozy. Free pattern with purchase of Zealana AIR Lace Weight yarn. Free Pattern with purchase of 2 balls of Zealana Air Chunky Weight yarn.